Many months ago, I came across an article that was featuring 40 different Mumbai street food you shouldn’t miss eating. Knowing my penchant for street food, I clicked away hurriedly to check out what those 40 street food were and how many I have tasted till date. Very few that I know were actually listed in that article and that proved a very good starting point for me to know further. I was already reading so much about Kathi Roll and how wraps are famous, then of course were the many chats. When it comes to street food, obviously you know there is no one original way to cook it. Each vendor might be adding their own usp to it. 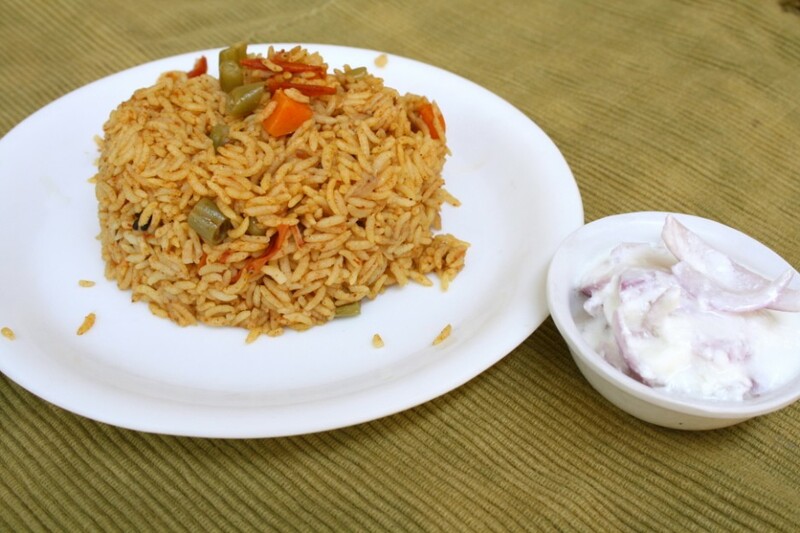 It is no wonder that when I embarked on a journey to know more about this tantalizing dish called Tawa Pulao, I couldn’t find one similar recipe. Each one to himself, seems more the motto. However one common masala that seem to be the one to be talked about was the usage of Pav bhaji masala. I can very well understand how this must have come about. The Mumbaikars are attached to their Pav Bhajis, since this must be a daily affair, they must have thought having rice on the menu would be a good choice. So they included rice, and now to make it different they ought to create a new dish. Seeing pav bhaji masala is always handy, this must have got added and there you have a new rice dish created! It happens to be me all the time. I always stock Channa Masala, Pav Bhaji Masala, Kitchen King Masala. When I am in a mood for a different taste, I add these masalas to the subjis and end up with an awesome side dish. When I had taken the Rice dish for Kid’s lunch box, I had done exactly the same for Konda’s lunch Box dishes. When I eat with my colleagues at work, I always noticed that my colleague’s side dish ends up being even more tasty. On asking she said she adds Chicken Masala. My other colleague who is a vegetarian was worried if chicken was added to the masala. We assured her that it wasn’t so but the spices added to this will be more. Anyway coming back to the recipe, I always love one pot meal as it’s so easy to carry for lunch. I had used Pav Bhaji in Konda’s Aloo Rice. But this time I wanted to make it more spicy and with more vegetables as it’s typically made. 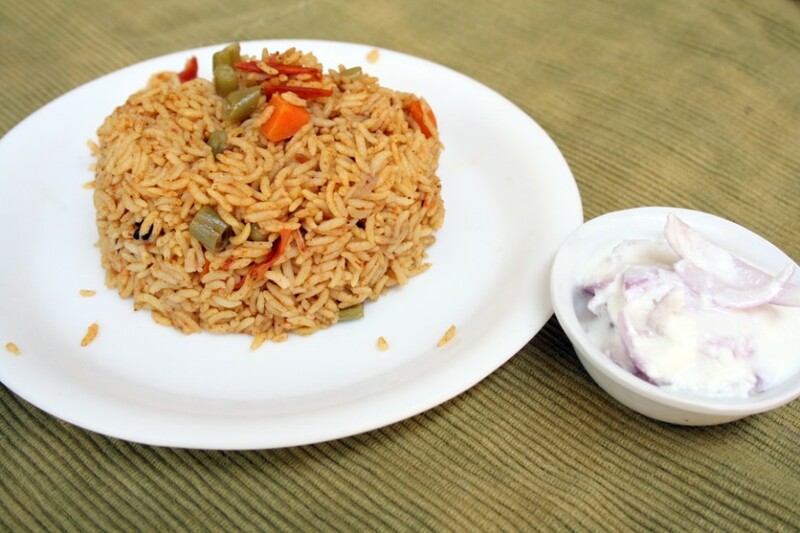 The way this Tawa Pulao is made, makes it easy if you have leftover rice. Though I don’t normally use leftover rice, I am sure it comes handy to know. Have the cooked rice ready. If you are cooking for this rice, then wash and soak rice for 15 mins. Either pan cook or pressure cook the rice till done. Make sure the rice grains are separate. For making the tawa pulao, take a big wide pan. Since we will not be having those huge tawas as in the shop, you can use a wide pan. Heat the butter, add all the whole spices and allow for the cumin seeds to crackle. Then add the onions, saute well till it turns colour. Then add the ginger garlic paste, slit green chilies, cook for couple of mins. Next goes the chopped tomatoes, salt and turmeric powder. Simmer and cover with lid. Once the tomatoes are soft, add the chopped vegetables. Cook on high. Sprinkle few drops of water for the vegetables to get cooked fast, keep stirring. Then cook in sim for 5 – 7 mins for the vegetables to get done. Then add the cooked rice slowly and mix everything well. Finally add the pav bhaji masala, garam masala, coriander leaves. Cover with lid and simmer for 5 mins. I added both whole spices and powders. This does tends to be spicy. You can add any vegetable that you want to include to make it more healthy. To get that authentic tawa fried, you can saute some rice on hot tawa and let it smoke for a couple of minutes. This adds very nice aroma to the entire dish. I keep doing that too..trying out different masalas in various dishes for a variation. The rice with pav bhaji flavour must be awesome.. I love rice dishes like this and i have here pav bhaji masala pack which i have to open up. My sisters kids are comming over from India so i think i will be making this for them once to stisfy their Indian food. I have seen this being made by a professional and it truly is a delight to watch and of course, to eat. Interesting. I have some of the masala with me. Will try it out. This sounds delicious with all those aromatic whole garam masala and spices.